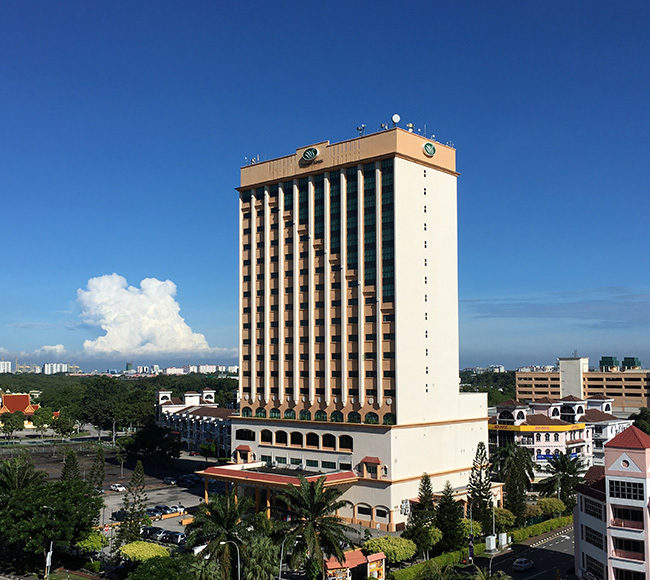 Strategically located in the Seberang Jaya town centre at the intersection of the North-South and East-West Highways, Sunway Hotel Seberang Jaya is conveniently accessible via a 30-minute drive from the iconic Penang Bridge and Penang International Airport. The hotel sits at the centre of of a vibrant hub which offers entertainment, leisure and shopping options which is perfect for holiday makers and corporate travelers seeking an easy access to the highly developed industrial links and commercial zones on Penang’s mainland. All 202 tastefully appointed guestrooms and suites offer a panoramic view of the surrounding area, whilst the Deluxe and Premier rooms provide a wide range of amenities at any time of the day. The Club rooms which are located on the upper levels feature a ‘Hotel within a Hotel’ concept with comfortable, provate and exclusive facilities and services fro the discerning traveler. The luxurious Suite offer a separate living area, Coffee Bean & Tea Leaf coffee making machine, air purifier and a dedicated work desk. The Club Lounge pampers guests staying at the Club Rooms and Suites with a wide array of exclusive facilities, breakfast and meeting venues as well as evening cocktails. Convenience and exclusivity is second to none. Head to Sun Cafe – an all-day dining outlet located at the lobby for a good mix of local and international dishes from the well-thought a la carte menu to innovative buffet selections served in a casually chic setting. For social gathering or a great night out, the Lounge is the place to unwind. Events and meetings are handled professionally and with flair at the function rooms and the Sri Cengal Ballroom which can accommodate up to 550 pax for various functions.